As seen in numerous videos from the 1960s through today, Robert Conti executes complex lines at upper level tempos flawlessly and with great ease. Now you will be able to develop your right and left hand the same way Robert Conti learned for unrivaled ability and control of the guitar. 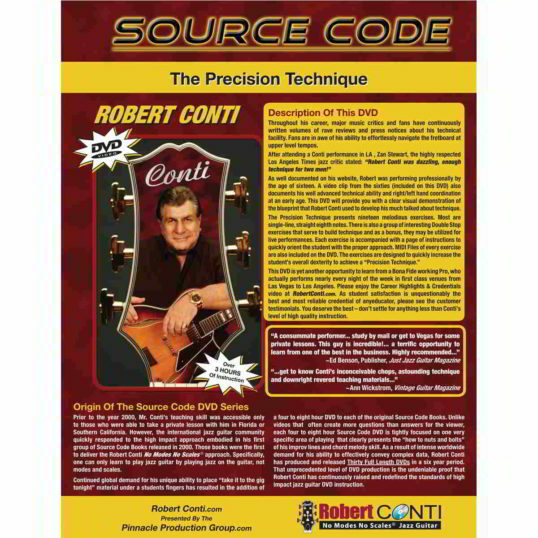 As seen in numerous videos from the 1960s through today, Robert Conti executes complex lines at upper level tempos flawlessly and with great ease as a result of developing a precision technique. 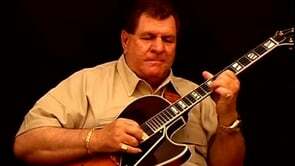 You can develop your right and left hand the same way Robert Conti learned for unrivaled ability and control of the guitar. 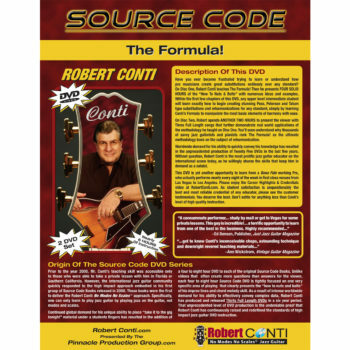 Throughout his career, major music critics and fans have continuously written volumes of rave reviews and press notices about Conti’s technical facility. 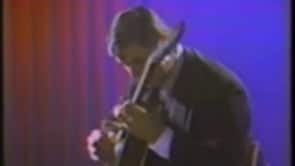 In line with his teaching philosophy that you learn to play jazz guitar by playing jazz guitar, it follows that right and left hand technique is essential. If you can’t physically play the jazz lines you’re learning, they won’t do you any good. Technique is the currency of playing and without it, you’re broke. Yes! 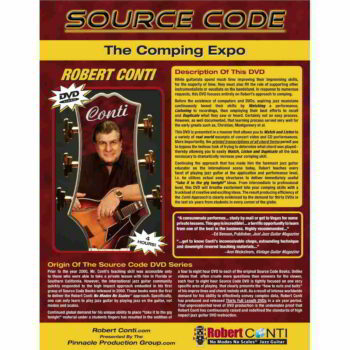 Robert Conti’s technical skill is the verifiable result of the time-tested blueprint he presents in this DVD and book. Follow the same path to develop your technical chops. This book speed up my picking it feels like I can play twice as fast as I could before, what also has to do with this thin pick. I experiment with different picks before, but never used such a thin one, because when I tried thin picks they deformed and were looking pretty soon like a boomerang not usable. I’m playing Guitar since 44 Years and I’m interested in playing jazz since 10 years, I never made that big progress in such a small period (2 month). Thank you for all these books Mr. Conti. A month with this material has done more for my technique than the countless hours spent with the cardboard box full of technique books now exiled to my closet. This material synchronizes the right and left hands. The Wohlfahrt pieces run from 20-40 measures, so it isn’t simply repeating one short figure up and down the neck: while each exercise might have a particular focus (-shifting positions with the first finger, or crossing several strings, giving the pinky a real workout) they all involve the integration of several aspects of technique. Beyond the Wohlfahrt exercises, Conti adds six of his own that focus on moving up and down the neck, double stops, and a few other goodies. Make no mistake, work is required. But unlike other material on technique I have tried (and tried) this material rewards work with real results because the material delivers the goods: vastly improved technique! Thank you, Robert Conti! Too many people have told me too many good (-make that GREAT) things about this DVD—gotta get it. Conti is blindingly fast, yes, but MUSICALLY so, lyrically so. And it inspires me that he’s an, um, big guy as am I. Speed ain’t just for the twitchy little guys! ;o) If you’ve never heard Conti play, check him out on Youtube–you will be amazed. The Precision Technique DVD is my daily bread. I’m 54 and I started playing guitar in elementary school, had beginner lessons and later on jazz lessons, and I’ve got two cardboard boxes full of guitar books and all that together did LESS for my playing than a couple weeks with The Precision Technique! I switched to the .38 Dunlops and love them. I’ve been refining my pick grip day by day and the improvement in my playing is remarkable. I’m thrilled, though I can’t help wishing I’d ‘seen the light’ about 30 years ago! But hey, better late than never! Thank you so much from a very satisfied and future customer. I’m very pleased with Conti’s approach to jazz guitar and I have seen improvement within a short period of time. I have been playing for a few years and got caught in the academic approach, got discouraged with my progress, and recently came back with enthusiasm due to the Conti videos. I will be purchasing other material over the course of my learning and playing. After seeing clips from your videos on YouTube and picking up Jazz Master on Truefire, I decided to invest in The Jazz Lines. On that DVD you mentioned The Precision Technique, so I decided to get that, too, especially after seeing the economy of your right-hand movement. On Precision Technique, I was amazed to hear you say that you used the 0.038 Dunlop nylon pick, because I’ve been using Jazz III picks or the moral equivalent for years. Not wanting to be close-minded, especially after seeing your demonstrations and hearing your arguments in favor of a thin pick, I decided to give it a try. By the third day of steady practice, it produced the first real breakthrough in my picking technique in twenty years, so I felt obliged to write and say thanks. I’ve been pushing speed limits that were not possible before. For me, just going 110 is a breakthrough, and I’ve been touching 120. I have gotten to like the Dunlop .046 nylon pick because it’s light enough to eliminate the accursed bounce that you describe and demonstrate on The Precision Technique, but there’s enough impact for a good dynamic range. I found .038 a little too soft, but I may change my mind. Anyway, don’t want to take all day to explain this — I think your DVDs are outstanding, and I really enjoy them. You not only know what you know, but you know what the audience DOESN’T know, and you take the time to anticipate their misunderstandings and clear them up. That’s the mark of a great teacher. Hi Bob, I love your Jazz Guitar materials and they are helping me make a “mid-life” come-back to Jazz playing! You’re “Precision Technique” is amazing. After about 2 years of work with your stuff, I joined a Big Band doing mostly old-school swing. It’s mostly four-to-the-bar comping but some opportunities for soloing and more “modern” chordal comping. Thanks again for what you do! I have just received the DVD and book and spent a couple of hours watching, reading and already into the lesson. I really enjoy listening to Robert, I have never met him but already feel he’s a friend so to speak. I am getting more out of his lessons than I got out of years of one on one instruction from teachers. I actually quit playing 20 yrs. ago out of frustration, I was playing in a popular country band for years but always was interested in Jazz and could never find a teacher or book that unlocked the secrets, with Robert’s materials I now have a new outlook and feel as though playing jazz is actually within reach in the not too distant future. I can say this is the best and most detailed discussion I have ever seen on right hand technique and Robert makes logical conclusions to solving old problems. Most courses or teachers hold back the mystic secrets and only give up enough to keep you coming back, Robert gives you all you need and then some!!! I hope to someday have the pleasure of meeting Mr. Conti, just by watching his videos for so many hours makes me feel as though he’s a regular kinda guy deep down and truly wants to help us mere mortals in guitar land. Someday I hope to purchase one of his guitars as well. Well, Mr. C has done it again. His no modes no theory approach is the way to go. I’ve spent at least a good ten years studying scales and modes and much to my disappointment was no more closer to my goal of improvising jazz standards. And keep in mind, not only jazz standards but other music as well. For example some country western, latin and others. I wish I would’ve found Mr. Conti’s books ten or fifteen years ago. Needless to say I am glad I found them I now I am playing some real “cool” lines; and yes I am understanding them too. Thanks again Bob!!! Bob, Well, I’ve tried a lot of your materials over the years and have always been impressed. You are wonderful player and a great teacher with lots of unique concepts. However the soft pick that you use is one of the most unique technique ideas I have seen in years. When I got the technique book in the mail I opened the package and as soon as I saw the two picks taped to the cover I immediately threw the picks away before I even opened the book. I thought they were just some sort of gimmicky advertisement for a manufacturer that you endorsed. I couldn’t imagine anyone actually using the things. When I put in the DVD and saw that you were serious about them I had to dig them out of the garbage. I made a serious effort to learn to use them and was surprised that they work so well. In the long-run don’t think they are for me but the have caused me to re-look at my own technique. Many years ago I switched to holding the pick very, very loosely and this accomplishes much of what you get with the light pick and I think it gives a better tone but, never the less I am impressed. Keep up the great work. Robert Conti, I love your teaching, and your playing I got to get some of this. One of the best jazz educators around. He’s an amazing guitar player and very passionate about what he teaches.